The German Silver Ring is a symbol of prowess (and only prowess) in Cut and Thrust fighting in the East Kingdom. At this time no other Kingdom has a ring of German Silver, though the maker is willing if another Kingdom wants one. German silver, also called nickel silver, is a nickel alloy – this ring is made from that alloy. The German Silver Ring was made by Grim the Skald in A.S. 52. He was inspired by reading about the Steel Ring of the Mid-Realm. The Principle holder of the German Silver Ring shall be determined in a Cut and Thrust tournament at the East Kingdom 50 Year Anniversary event. The following rules for the German Silver Ring are pending until that time. If you have any comment on these rules, please let Grim know, he can be emailed at his name (no dashed or spaces, including the nickname) at gmail. 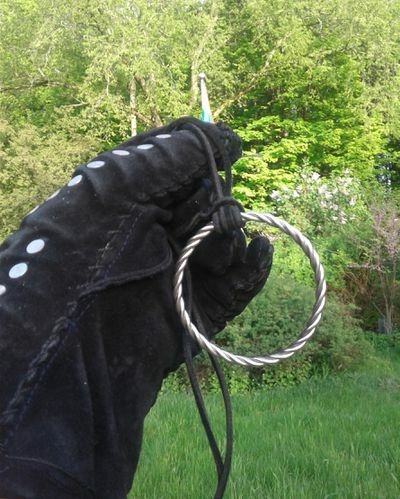 In the spirit of the Iron Ring of the East, the German Silver Ring is intended to be passed from holder to holder throughout the East Kingdom. The only way to acquire the German Silver Ring is to challenge the current holder. The holder of the Ring is required to accept the first Challenge in a day. The second and third Challenges are optional, and the holder should only accept those if they feel that they can show sufficient prowess and stamina after the exertions of the first Challenge. The Challenge can only be made while both participants are fully in dress rapier armor (i.e. non-period practice armor is not acceptable) and there is still opportunity to fight that day. The Challenge must be met before said rapier armor is removed or the holder forfeits the ring to the challenger. Non-period safety gear is allowed - this stipulation is simply that both parties should be dressed as they would be for an event, rather than a practice. However, the Challenge may take place at any SCA-Sanctioned event where there is rapier fighting, including at a fight practice. The challenge is to be negotiated by the challenger and the holder. Seconds can be used if both combatants wish. Negotiations include weapons forms, weapons lengths, style of combat, terrain, and how a double kill is treated (loss for both and/or refight.) Other things may be negotiated so long as they fit within the greater framework of SCA Cut and Thrust Combat. Negotiations cannot be used to force a combatant to forfeit if they are not authorized in a particular form, though the challenger must be authorized in Cut and Thrust to issue the Challenge for the Ring in the first place. The German Silver Ring may only be exchanged once in any given day; if another challenger requests a Challenge to the new holder on the day they have won the ring from another, the holder is required to decline the Challenge. The German Silver Ring may not reside outside of its Kingdom's borders. As such, it will revert to the previous holder if the current holder moves from the Ring's home kingdom or stops playing. If the current holder believes that they cannot fulfill the obligations of the ring for an extended period of time, they should pass it to the previous holder. If the previous holder is not available, any previous holder is acceptable. The German Silver Ring shall be worn prominently while in period armor so potential challengers may know who the current holder is. The current holder is encouraged to wear it whenever they are in period garb, though they cannot accept a challenge until they put on armor. Lastly, it is the duty of the outgoing holder of the German Silver Ring to make sure the incoming holder is fully aware of these rules. The ring is in fact made of nickel alloy obtained from a jewelry supply company. The metal is 65% copper, 17% zinc, 18% nickel. It is clear-coated but those who are allergic to the metal should be aware of it's composition. The maker of the German Silver Ring requests that you not mount it on a wrestling belt unless you hold it for several years. The ring has yet to be given out - it is in the possession of Grim the Skald. It was intended be given out to its principle holder at the EK 50th Year Anniversary event. Unfortunately, the first tournament was cancelled due to excessive heat on that day. The tournament has been rescheduled for Mudthaw - the tournament format shall be as follows. - Rotating forms – you may not fight in the same form as you fought the last round. Each East Kingdom rapier authorization is considered a separate form (e.g. long sword, sword and buckler, single sword, case, etc.) Please note you can explicitly return to a form once you have fought at least one fight in a different form. - For the first round, the person who scored second in the Round Robin shall declare their form first so that the top fighter can respond. The person who declares first shall switch each round. - Double kills shall be refought until a clear winner emerges. The winner shall be the principle holder of the German Silver Ring and be expected to abide by its rules. Those not eligible (i.e. one who lives outside of the East Kingdom,) can compete but cannot be one of the two in the Finals. This page was last edited on 27 February 2019, at 21:18.